The research in Chen group is cross-disciplinary, bridging up mechanical engineering, chemistry and materials science, focusing on electrochemical energy storage related materials and devices, as well as functional and structural metals/alloys. 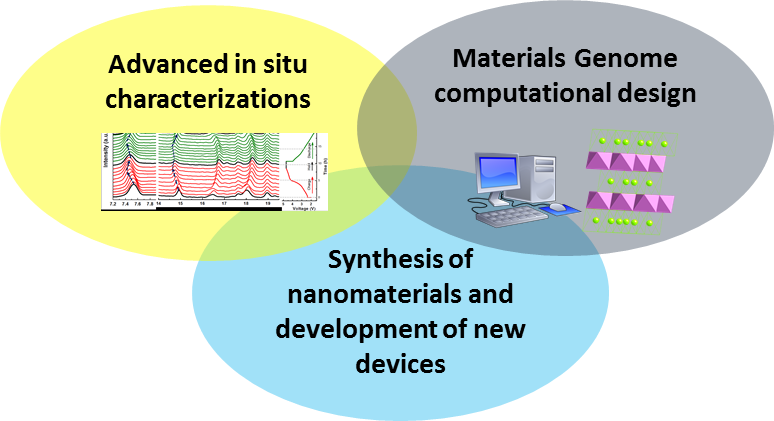 The technical expertise of the group include development and application of advance in situ characterization methods for energy storage devices, computation-aided materials design and novel synthesis methods for nanostructured materials. The experimental methodologies for “Materials by Design” (e.g. the Materials Genome approach), including high-throughput synthesis and in situ XRD for synthesis. Development of advanced in situ characterization techniques, including in situ TEM, in situ solid state Nuclear Magnetic Resonance (SS-NMR), and multiple in situ X-ray technologies utilizing synchrotron and bench top X-ray sources (diffraction, absorption and pair distribution function analysis, etc.). Electrochemical energy conversion and storage technologies: Li-ion and Na-ion batteries, Li-metal batteries, all-solid-state batteries, and recycling of Li-ion batteries. Understanding the formation mechanism, nucleation, crystal growth, phase and morphology control of functional materials. Development of novel method for the syntheses of nanostructure materials in off-equilibrium conditions and development of new characterization tool suites to understand the synthesis processes. 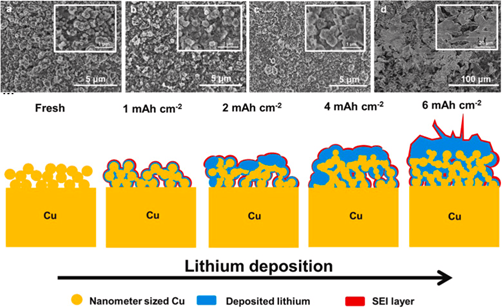 Ma XT, Liu ZT and Chen HL# Facile and Scalable Electrodeposition of Copper Current Collectors for High-Performance Li-metal Batteries, Nano Energy. 59 (5), p500-507, 2019. Ma XT, Nolan AM, Zhang S, Bai JM, Xu WQ, Wu LJ, Mo YF# and Chen HL#. Guiding Synthesis of Polymorphs of Materials Using Nanometric Phase Diagrams. (2018), 140, (49) p17290-17296, Journal of the American Chemical Society. Liu L, Li X, Bo SH, Wang Y, Chen HL, Twu N, Wu D, Ceder G. High‐Performance P2‐Type Na2/3(Mn1/2Fe1/4Co1/4)O2 Cathode Material with Superior Rate Capability for Na‐Ion Batteries. Advanced Energy Materials. 2015, 5, 1500944. Li X, Ma XH, Su D, Liu L, Chisnel R, Ong SP, Chen HL, Toumar A, Idrobo, JC, Lei YC, Bai JM, Wang F, Lynn J, Young, L, Ceder G. Direct Visualization of the Jahn-Teller Effect Coupled to Na Ordering in Na5/8MnO2, Nature Materials. 2014, 13, 586-592. Chen HL, Hao Q, Zivkovic O, Geoffroy Hautier, Du LS, Grey CP and Ceder G. Sidorenkite, a new intercalation compound as cathode materials for Na-ion batteries. Chemistry of Materials. 2013, 25 (14), 2777-2786. Chen HL, Hautier G, Ceder G. Synthesis, computed stability and structure of a new class of inorganic compounds: carbonophosphates. Journal of the American Chemical Society. 2012, 134 (48), 19619-19627. Chen HL, Hautier G, Jain A, Kang B, Doe R, Wu LJ, Zhu YM, Tang YZ, Ceder G. A new class of cathode materials for lithium ion batteries identified computationally. Chemistry of Materials. 2012, 24 (11), 2009-2016. Danna Q, Hinoma Y, Chen HL, Du LS, Grey CP, Ceder G, Meng YS. Electronic spin transition in nano-size stoichiometric lithium cobalt oxide. Journal of the American Chemical Society. 2012, 136 (14), 6096-6099. Chen HL, Wu L, Zhang L, Zhu Y, Grey CP. LiCoO2 Concaved cuboctahedrons from symmetry-controlled topological reactions. Journal of the American Chemical Society. 2011, 133 (2), 262-270. Bhattacharyya B, Key B, Chen HL, Best AS, Hollenkamp AF, Grey CP. In situ NMR observation of the formation of metallic lithium microstructures in lithium batteries. Nature Materials, 2010, 9 (6), 504-510.